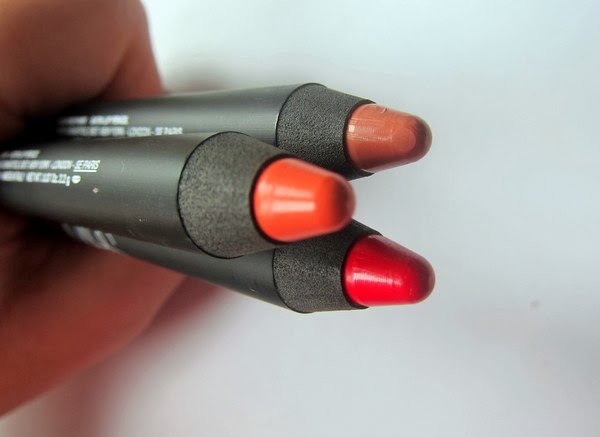 Ok, listen up: the NARS lip pencils are fan-dabby-dozy. Yes, they require sharpening and yes, we'd all prefer that they just twist up already, but for the amazing textures, shade range and ease of application, we're going to let that slide. The satin pencils were my first discovery, launching back in Spring '13, with the velvet variety hot on their heels. Priced at €25, both are lovely with the satin range having more slip and sheen, and a touch less pigment, than their longer-lasting matte mates. The raspberry Luxembourg and creamy coral, Lodhi, are my favourite in the satin range - they're swatched for you here - but lately, I've been all about Cruella. I'd been hunting for Dragon Girl but Brown Thomas was sold out, and I couldn't just leave empty handed, now could I? (Don't answer if you're reading, Mr Fluff). Red Square and Cruella both appealed but, while I own a bunch of orangey reds, there was a huge and gaping Cruella shaped holed in my life. This deeper, cool toned red can be drawn on in a jiffy, and the formula is insane. Despite it's modern, bold matte finish, it's comfortable to wear and won't leach the moisture from your lips. It lasts for hours, resists transfer and fades evenly - in summary, it's close enough to perfect, and you probably need this in your life. Like, STAT. Red Square and Dragon Girl - I'm coming for you soon. Check out Cruella in action in my latest beauty video.